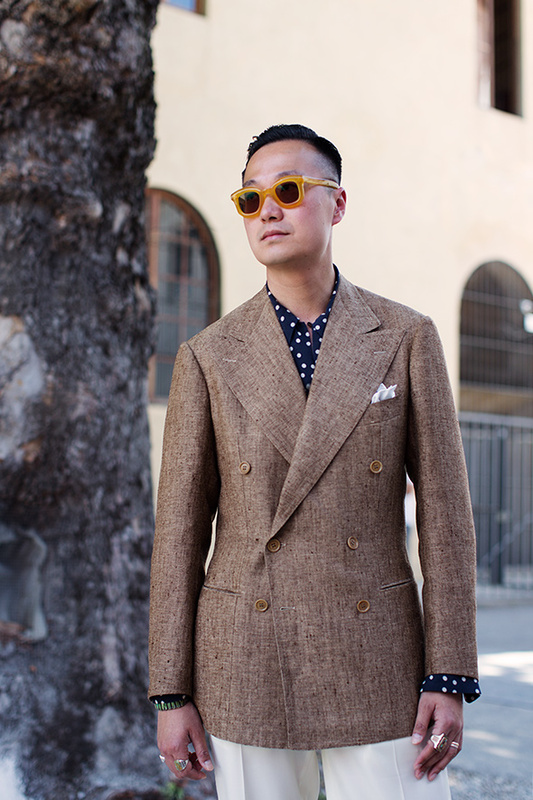 Love the casualness of the dotted shirt under (why I consider more formal) DB jacket. The jetted pockets give the jacket such an elegant look…love the sunglasses! Love this look – the superwide lapels and the chunky rings. Minimal but with a quirky touch. Love his style! He looks so cool! Dude! The opposite of the Power-Suit; The Power Sports Jacket.I can’ go this dramatic, but I admire the heck out of him for his “Take No Quarter” statement. Very well-done, sir. I’ll bring the Ferrari right around. For a moment there I thought he should go easy on the jewelry, but no, he looks so well put together and this adds a little whimsy, a little flair, a little exoticism, I love this look, it smells like Cote d’ Azur. Jacket is perfection in proportion and fabrication. The patterns and colors are great, but the cut of the jacket is not flattering at all. He’s got the same issue I have, wide hips, so he should probably avoid double-breasted jackets in general. Still, he’s great and interesting combos. This sun glasses are amazing!! The mix of pattern and texture is spot on. What I do like like is the silhouette; the narrow chest and shoulders – emphasized by the extra wide lapels – and flared hips does not appeal to me. Who does the photography for you? Simple and elegant, tells a great story. Florence at its best. This guy looks awesome. I’m now on the lookout for a polka dot shirt. Love this, looks great cool styles! Hey really such a great outfit dear Thanks for sharing this amazing post. Love the look, cannot get better. I don’t like. The DB jacket is better with a tie.